If you visit the Woodland Park Zoo, Seattle, there is a pretty good chance you’ll find me hanging out around the five Orangutans. I have been fortunate to hear people from BOS Borneo Orangutan Survival Foundation speak about what they are doing to help these endangered pals survive. The Woodland Park Zoo plays an ongoing role in their sucess. “In mid-May, our rescue team from Nyaru Menteng again joined hands with the Central Kalimantan BKSDA to conduct the rescue of a female baby orangutan in Pangkoh village, Pulang Pisau Regency. 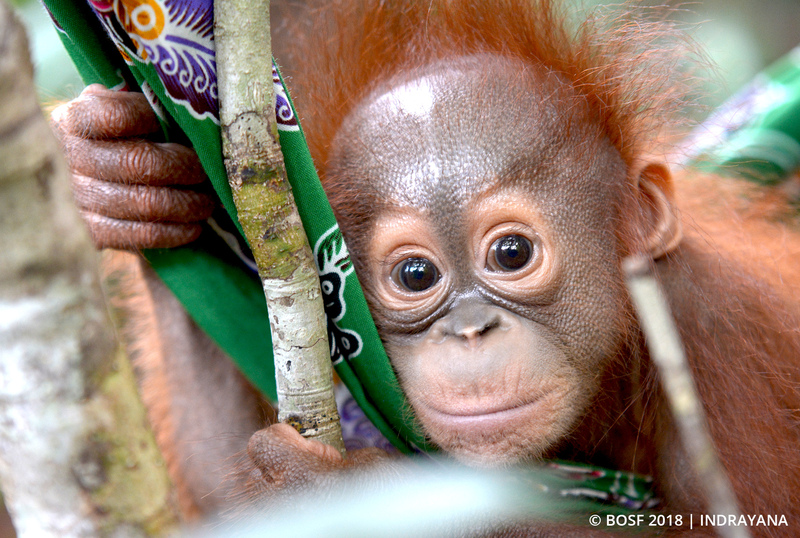 The baby was kept for several days by a villager before being reported to the Central Kalimantan BKSDA office. The villager claimed to have found the baby stranded alone in a forest area near a palm-oil plantation, and had decided to take her home. During captivity, the orangutan was treated like a human baby: she was bathed and dressed in baby clothing. Upon receiving the report, a joint rescue team from the Central Kalimantan Natural Resources Conservation Agency (BKSDA) and BOS Foundation’s Central Kalimantan Orangutan Reintroduction Program quickly headed to Pangkoh village to rescue the baby orangutan and take her to the Nyaru Menteng Orangutan Rescue and Rehabilitation Centre. An initial health check conducted by our accompanying vet revealed that the baby had not sustained any injuries and was in good physical health. Almost a month after her arrival, this very young baby orangutan – estimated to be about 3 months old – is still undergoing quarantine at Nyaru Menteng. Thus far, there have been signs of positive progress; she has gained some weight and will actively play in the quarantine facility’s playground area. She really loves to play with the leaves provided by babysitters, or with her blanket in the mornings. Understandably, she still relies heavily on our babysitters, and requires a lot of reassuring hugs and warmth: In the wild, a baby orangutan at this age would be clinging to its mother for breastfeeding and warmth. The baby is now under the observation and constant care of our veterinary team and dedicated babysitters at Nyaru Menteng. She now weighs 2.6 kg, and regularly consumes milk and mashed-up fruit. We will make sure, as with all the other orangutans in our care, that this baby will be placed in the best possible environment for optimum, healthy growth and skill development, so one day she will be able to return to the wild.